Lake Rd, in the suburb of Northcote on Auckland’s North Shore, is a busy main access road through the area. During the morning peak the road has long queues waiting to access the Auckland Harbour Bridge. This means that access to the work site is extremely limited and, in fact restricted to a narrow corridor up the middle of the road during the long morning peak. 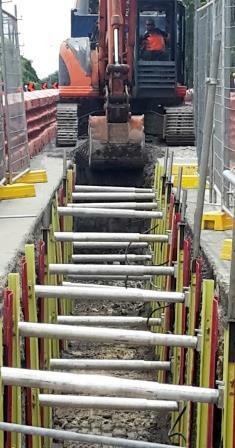 To overcome the access problems the shoring system needed to be able to be installed quickly and easily without needing heavy machinery or needing to use the roadway outside of the trench line. Gripshore is manufactured from GRP (Glass Reinforced Plastic). It was developed by MGF in the UK and is available in New Zealand from TSNZ for hire and for sale. Each set of soldiers is installed progressively as the trench is excavated until the required 24m length of open trench is achieved. Soldiers are installed from the ground surface without workers needing to enter the trench. Each set is lowered into position then pumped out until the minimum 400 psi pressure, required to achieve soil arching, is achieved. Trench base and bedding preparation are then safely carried out. Once the trench is ready to receive the pipe, it is easy to quickly remove the soldiers allowing the entire 24m length of pipe to be lowered into position. Soldiers are then reinstalled above the pipe to keep the trench safe and allow back filling. Pipeline & Civil take safety seriously, hence the effective shoring system used. But, also they value efficiency and Gripshore delivers.